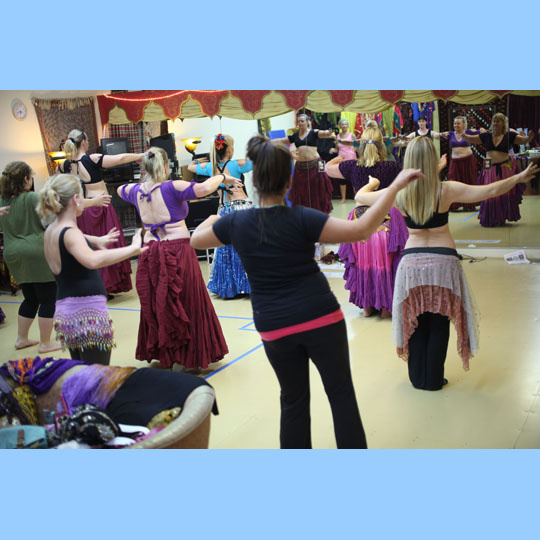 The BellyDance Class and Drum class are at the same time in different rooms: All ages and levels are welcome 6-80 yrs!! Please come and share Wiggles and Giggles for 2018!!!! Call me to get on list and let me know what the best days and times are for you. We are available for Party Performances. We love themed parties! 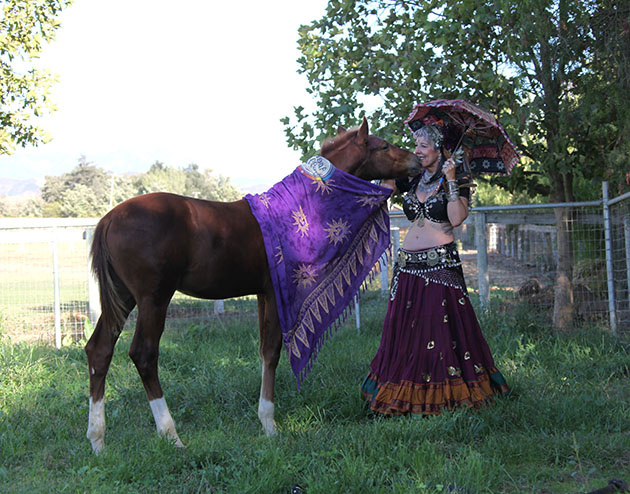 Tribal Gallop Classes-Fun, fun, fun! 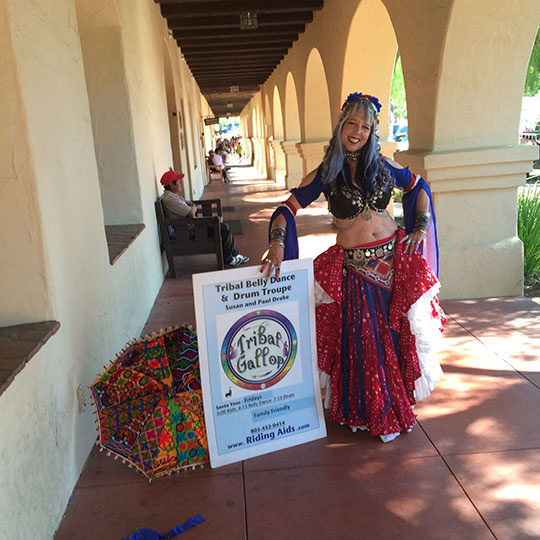 BlackSheep BellyDance(BSBD) format is a beautiful new family friendly American Art form with ancient traditional Tribal influences from the Middle East, Egypt, Turkey, Eastern Europe, Spain, India, North Africa and the trail of Gypsies. 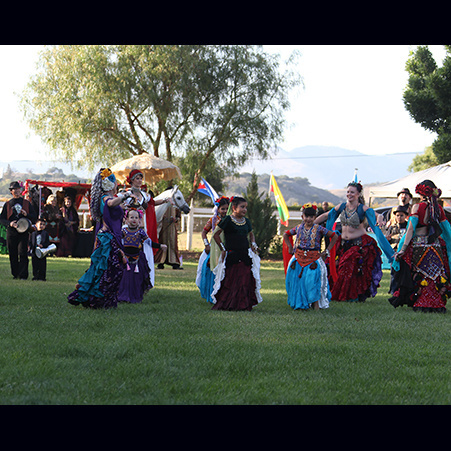 The mixed folkloric colorful costumes accented with rich tribal jewelry, music, dance, and tribal community makes it a fulfilling new activity. 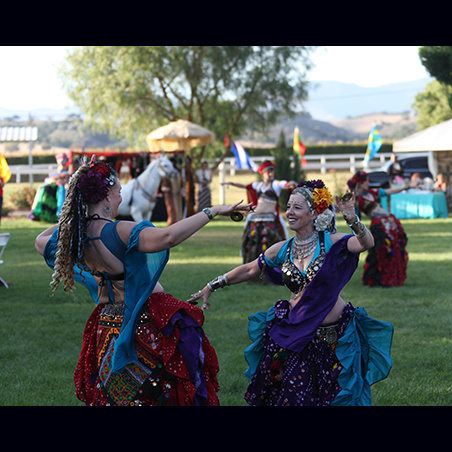 It was created by Kajira Djoumahna in the 90's and is now offered by a new Belly Dance and Drum Troupe, Tribal Gallop,in Santa Ynez with BSBD Certified Instructor Susan Derr Drake and drummer, Paul Drake. 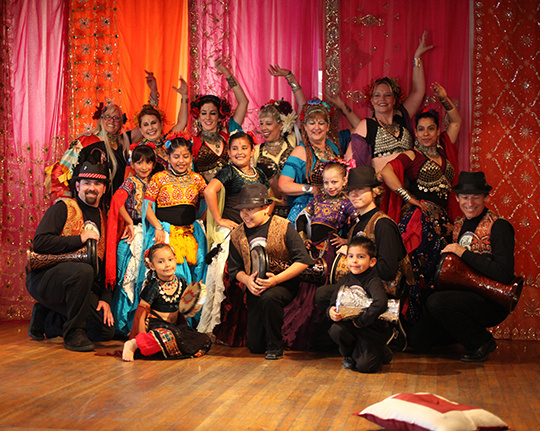 This Synchronized Group Improv (SGI) dance style has 2-20 or more dancers. The interchangeable leader uses a shared non-verbal language of cues like the nod of a head, position of an arm, angle of body or other subtle gestures to instantly tell the followers what to do. This creates a moment-to-moment, non-choreographed, improvised dance that moves like a flock of birds or a school of fish in matching each other’s movements. 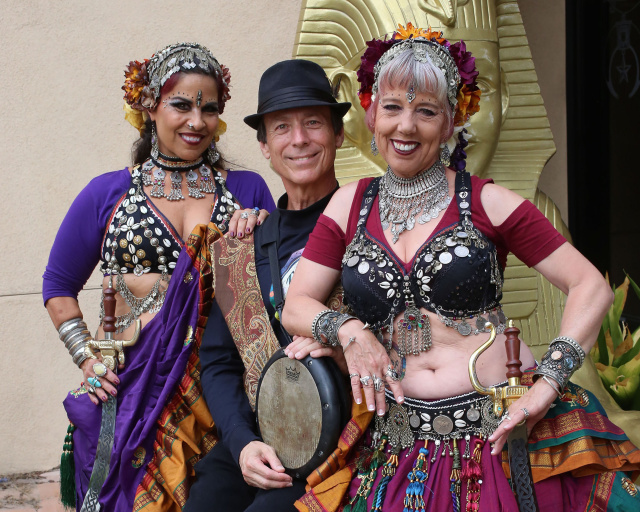 BSBD format leads from both sides and uses both sides of the body to increase suppleness, strength, coordination, and balance while feeling an energetic, non-touching, connection to the other dancers. 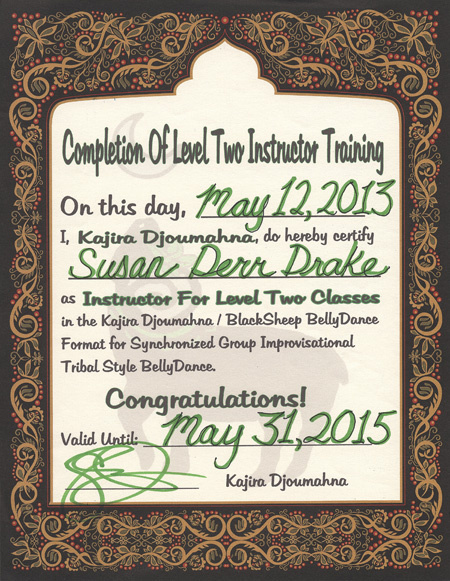 After the first class of learning only 2 moves your can dance! 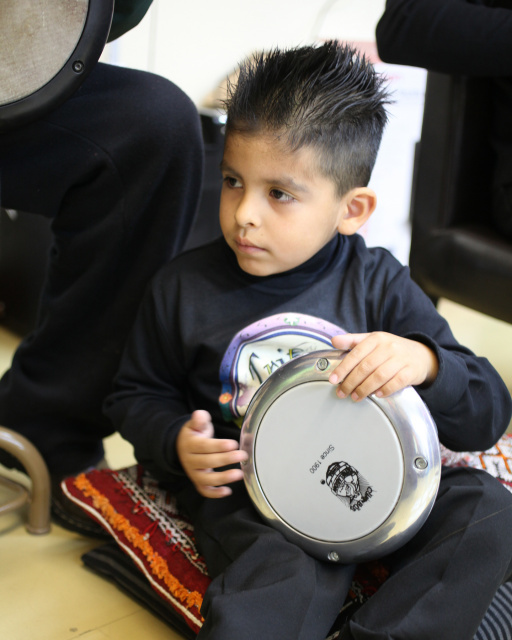 There are 80+ easily learned fast/rhythmic and slow/arhythmic steps through Level 1, Level 2, and Level 3. 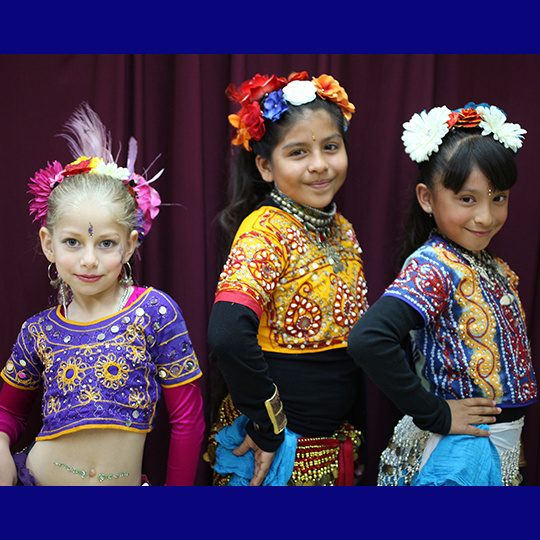 Dancers can dance with anyone around the world knowing this SGI format. 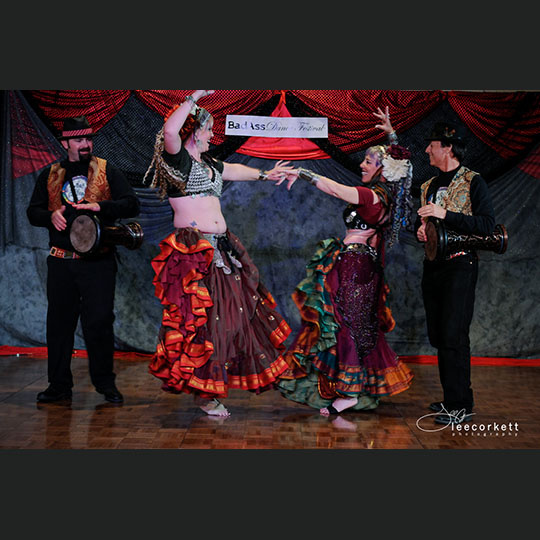 Dancers may use Zills (finger cymbals), swords, veils, baskets or other props taking the audience to a deeper feeling of the music through their interpretations. What to wear in class: Comfortable! Yoga pants, breeches, skirts, T-Shirts, Cholis, hip scarves, barefoot, socks, dance shoes. prepare to have fun and support each other. 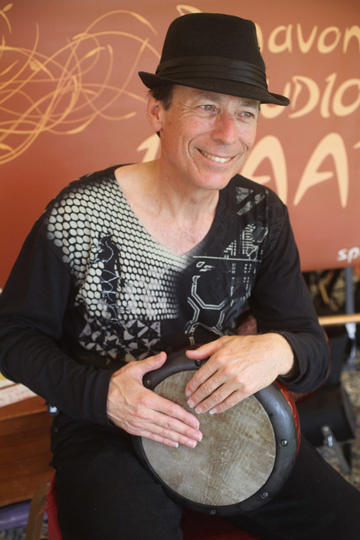 Drum Class with teacher: Paul Drake The Drum Class welcomes Zills, Tamborines, Doumbek, Tablah, Middle Eastern Drums and any world instruments. We will start with the very basic understanding of how to hold the intruments, how to use your hands and the practice of 3 basic notes called Dum, Tek and Ka that sound like "giddy up, giddy up, giddy up". We will start with basic rhythms: Gallop, Kalegi, Beledy, Ayoub, Chiftatelli, Masmoudi and others. 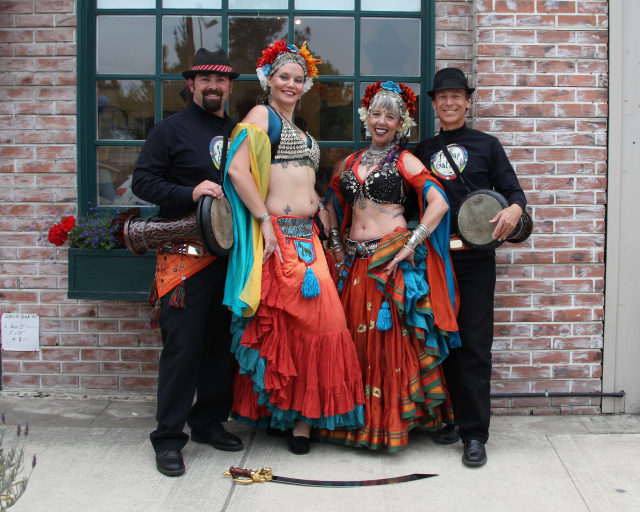 The goal is to accompany the dancers and develop the drum troupes own repetoire of layers of more complex rhythms. 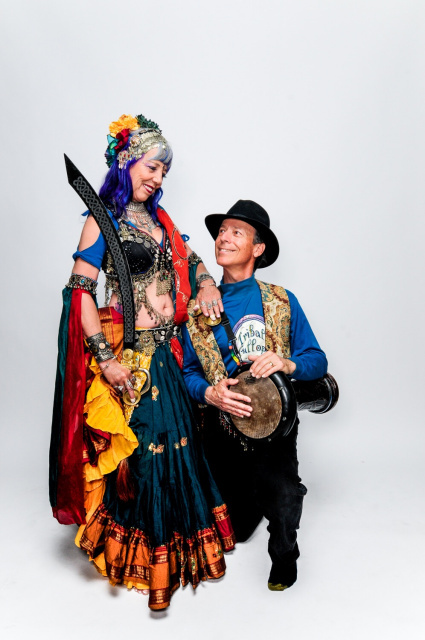 We will provide Zills and drums until you invest in your own. 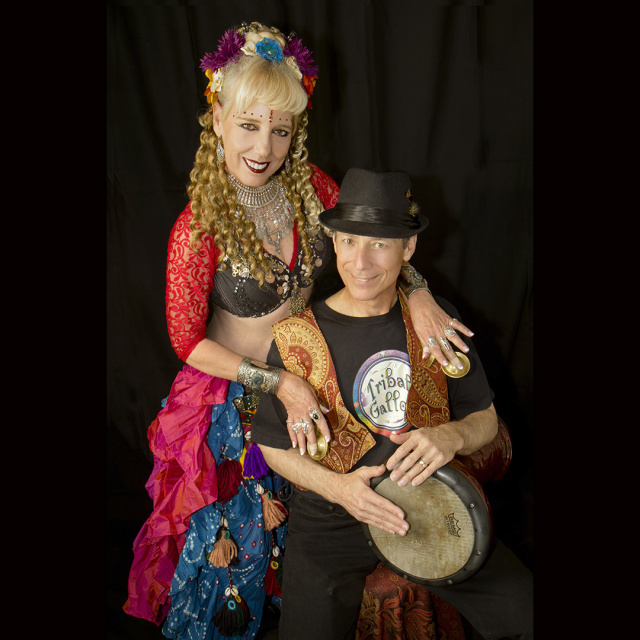 For performances at your party or event please contact us. What is in the name Tribal Gallop? Tribal because it is an Art form that includes all to form a tribe; people with a common interest that support each other. 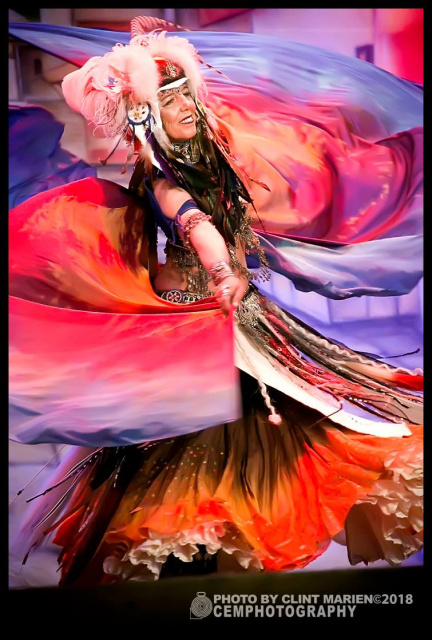 That interest is to learn and have fun with music, drumming and bellydance. 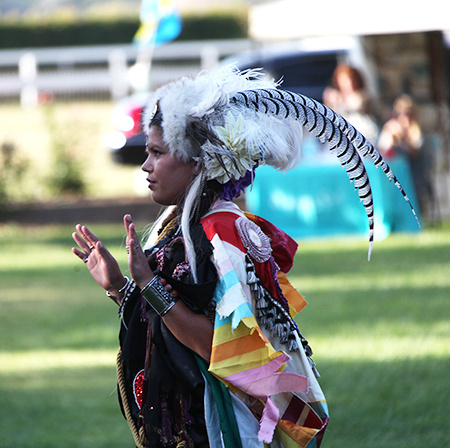 Other tribal members may be supportors like photgraphers, costume designers, and organizers. What is in the logo ? Circle to represent the drum and safe, sacred circle of our tribe. Notes to represent the love of music for the drummers and dancers to play. Chakra Colors to remind us to live in balance and fullfillment from foot to head and beyond. Flowers to represent the four directions. Indigo, white, navy to represent life colors of Susan's journey. Tan circle to represent the Drum Skin and Neutrality within the tribe that all are equal. Two Silhouetted Dancers to represent the clarity of form to lead and follow from both directions. The Sword to represnt that we are on the leading edge of life with a smile. The Horse to represent the personal power we hold within and to remind us to be sensitive yet strong as we 'gallop' forward in passion. The Heart, while always protected, finds the space to open and share love. 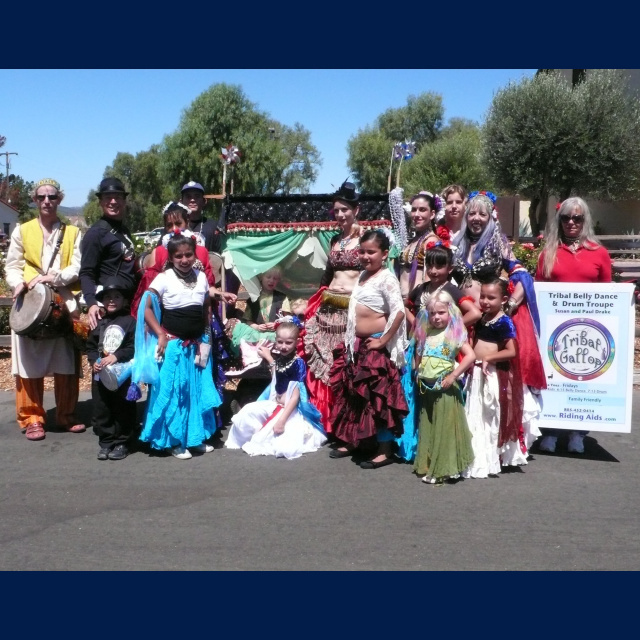 "I am so very grateful for the two years I learned from and danced with Blue Moon Haven. Please join us & register for classes today. From Maggie Chambers: "It's so much fun learning with you, you make it very comfortable." 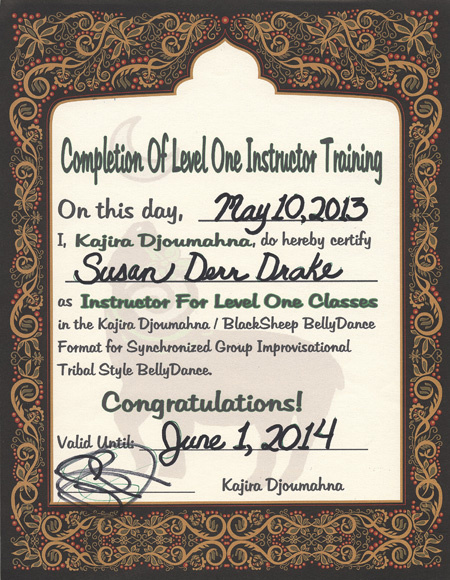 I have been taking Black Sheep Belly Dancing with Susan Derr Drake for 10 weeks now, it is the most fun I think I’ve ever experienced in dance! 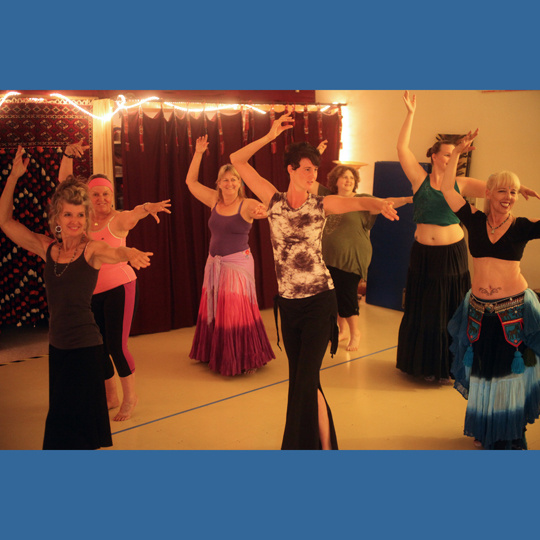 Susan brings a unique balance of positive energy, enthusiasm, and a basic learning strategy to assist her students in feeling that they can accomplish this unique dance style. As a leader her demeanor is always attentive, posturing a sincere interest in helping her students learn the movements and praise them for their earnest attempts and accomplishments. Her ability to verbalize an immediate evaluation always indicates that she cares, and is in touch with the challenges we may face as a beginning dancer. One of the most attractive leadership skills Susan exhibits is her open mindedness in evaluating our presentation, she is always supportive, and inquisitive as to how we may have reached the conclusion we did to turn in the wrong direction, however always supportive with unique ideas to help us learn. With humor and joy she inspires us! As I mentally tip-toed into the idea of performing with all my insecurities, Susan assured each that what we had learned was enough to put it all together and perform. Her ability to set goals and objectives for the troupe helps all of us to see beyond the moment. She is eternally considerate of each individual dancers challenges however, continues in a positive vein to support each dancers goals and aspirations. 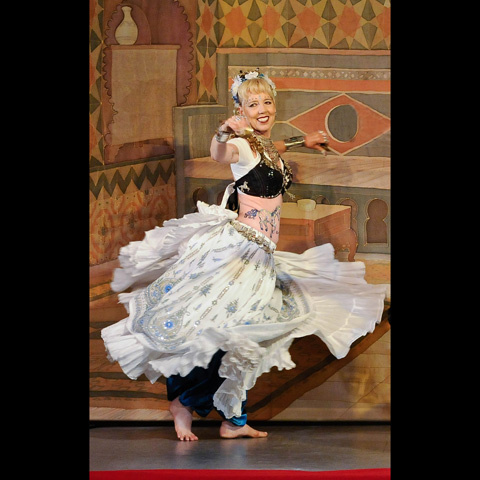 Susan’s style and joyfulness she exhibits in her dance is beyond inspirational on so many levels, I’m grateful for the opportunity to be a part of her troupe and excited about the journey we’ll take together. 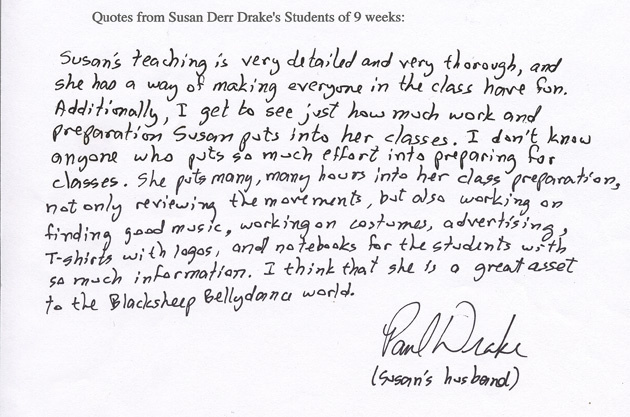 A remarkable teacher, and human, Susan is a gift of joy and enlightenment! Susan Derr Drake, www.RidingAids.com and all contributors may or may not be licensed physicians, veterinarians, clinical psychologists or practitioners. Any and all services, products and information offered may not be not licensed by the state, and are protected under the California legislation Senate Bill SB577 to allow Californians choice and access. The nature of the services, products and information provided are intended for the highest good of any and all beings. When ordering from this site or purchasing products and services from Riding Aids and Susan Derr Drake, you understand, agree and accept it is your free will choice and your responsibility, to do or not to do, to have done or not to have done, to allow or not to allow, to use or not to use, and you may research, any product, service or information provided by www.RidingAids.com, it's contributors and Susan Derr Drake before acquiring.